UPDATE: The Sunflower Trail is done blooming and is currently closed for the year. Nothing says summer like the beauty of a wide open field of sunflowers! VonThun Farms Sunflower Trail is located in Washington Twp., Warren County NJ. Although some farms have sunflower mazes, we have a trail that’s carved into our sunflower field. There’s lots of sunflowers that are open, lots that are starting to open, and, as of today (July 30), even more that haven’t even thought about opening yet! COST: Sunflower Trail admission is $3 per person (kids age 3 & under are free). Cut your own sunflowers for just $2 per stem. Take advantage of our Sunflower/Berry Bundle for only $10: Includes Sunflower Trail admission, 3 (cut-your-own) sunflowers, and a pint container for picking raspberries/blackberries. DON’T FORGET: Don’t forget to bring a camera. If you’re planning to take photos with your cell phone, make sure the phone is fully charged! You’ll be doing lots of walking, so be sure to wear comfortable shoes. It gets hot in the field. Bring a drink, and maybe even an umbrella on sunny days. Wear a hat, sunscreen, and closed toe shoes. The field can be uneven in spots, and the trail is dirt. Strollers are allowed, but may be tough to push in spots. Our farm market is open daily, 10am to 6pm. 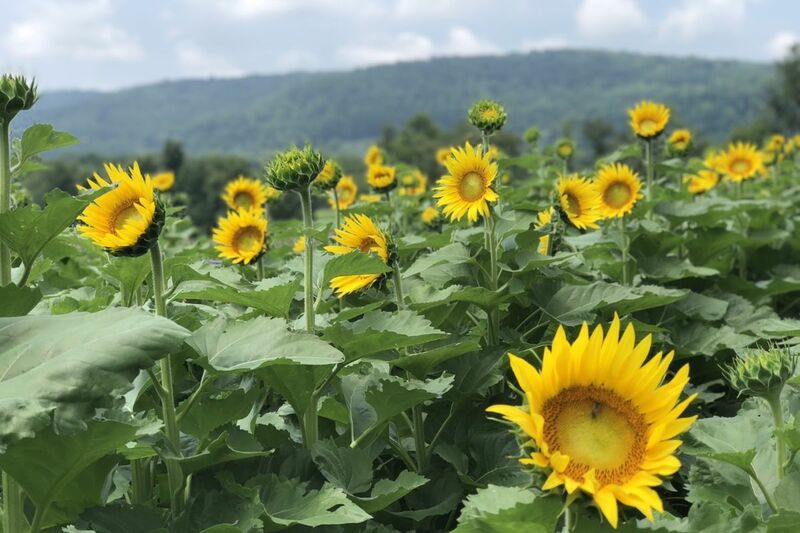 The Sunflower Trail is NOT offered at our South Brunswick location.